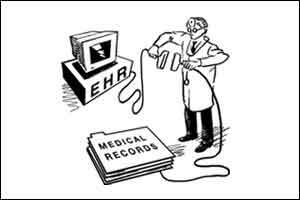 New Delhi: Medical Superintendent of Safdarjung Hospital, Dr Rajendra Sharma today stressed the need for a regulatory framework that mandates and regulates the use of electronic medical records (EMRs) to store health data of patients, according to a statement by the industry body ASSOCHAM today. A vast majority of hospitals and clinics still run on paper-based systems and have no centralised system to store medical records, Sharma said. A national policy for implementing the same is also under consideration. Such systems are currently being adapted by large central referral hospitals such as Safdarjung Hospital and AIIMS, he said while inaugurating a conference on ‘Health Security for All’, organised by ASSOCHAM. “The citizens of India will benefit from an integrated health information system across all states. This system will aid in all aspects of healthcare planning, delivery, and monitoring, including disease surveillance, patient medical records, planning for human resources, continuing medical education, facility registration, and telemedicine initiatives. “The same has also been envisaged as priority area in the National Health Policy 2017,” he said. The first step in the process of technology adoption will be to capture all patient health information at the point of care, especially hospitals and clinics. This information may then be shared with health information exchanges where it can be accessed easily by doctors and hospitals. It will save duplication of tests, the associated costs and precious time, in instances where minutes can make a difference between life and death. The next critical step is to ensure that the data is uniformly captured, interpreted and accessed by all those concerned. And, given the sensitive nature of patient health information data safety is the other vital concern, Sharma said. Mentioning that government wants to see more people come to its facilities which will require a fundamental shift in thinking, he said. “Unfortunately people are also wary of government health institutions due to the large crowds and unmatched resources for the larger population base. Reducing the out-of-pocket expense on healthcare is likely to address this problem and we may see it in time with the roll-out of the Ayushman Bharat National Health Protection Mission of universal health insurance,” Sharma said. As it stands, healthcare providers are not held accountable for a lot of their actions excluding the doctors who are liable under the Consumer Protection Act. Introducing accountability into private and government healthcare will require a profound culture change. Specific training in patient safety issues, making policy and implementation of patient safety standards is crucial to improving accountability, he said. Sharma further added that there is a significant emphasis in the government trying to increase the health outlay but the problems remain in the implementation of schemes, primarily due to lack of trained manpower and inability of the society to bear the higher cost associated with better level of training.